Brexiteers fear Theresa May could try to ignore the objections of her 'War Cabinet' to plans for a customs 'partnership' with the EU. The Prime Minister's favoured blueprint for future trade with Brussels was humiliatingly rejected by senior ministers at a tense three-hour meeting yesterday. New Home Secretary Sajid Javid and Defence Secretary Gavin Williamson joined Boris Johnson, David Davis, Michael Gove and Liam Fox in opposing the proposal for the UK to collect duties on behalf of the EU. 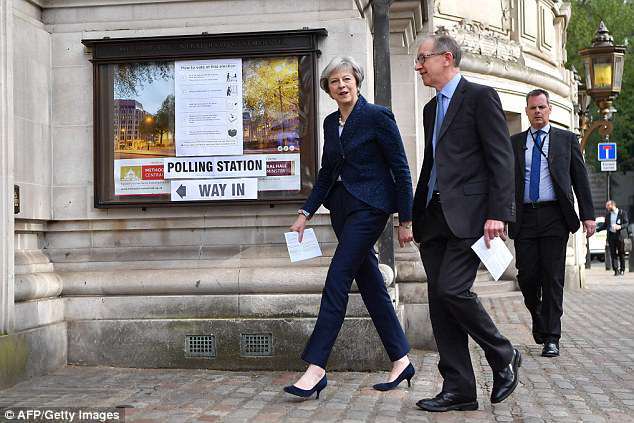 The knockback has left Mrs May scrambling for another option - amid warnings that any blueprint acceptable to Tory Eurosceptics will be voted down by the Remain majority in Parliament. However, Brexiteers believe the PM could make cosmetic changes to the proposal in a bid to 'peel off' Mr Javid and Mr Williamson, before bringing it to the sub-committee again. They are also braced for the possibility that she ignores the sub-committee's verdict altogether and put the plan to full Cabinet. One senior government source said: 'The plan got a kicking, but they don't seem to have any other ideas. We think she could try to peel off Sajid or Gavin. Cabinet Brexiteers regard the choice between the customs partnership and the so-called 'Maximum Facilitation' solution as 'binary' - making it even harder for Mrs May to come up with a compromise. The government is effectively going back to the drawing board with time running out ahead of a crucial EU summit in June. Mrs May is also under massive pressure from Remainers who are demanding that she U-turns altogether and agrees to stay in the customs union. 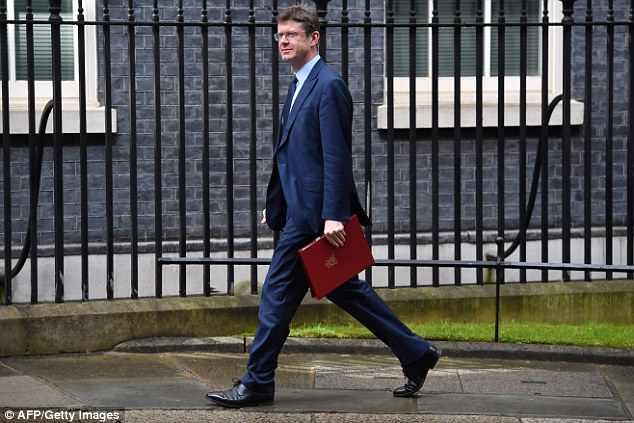 Chief whip Julian Smith is said to have warned Cabinet yesterday that the government would currently lose a vote on the key issue - which could potentially come to a crunch in the Commons next month. 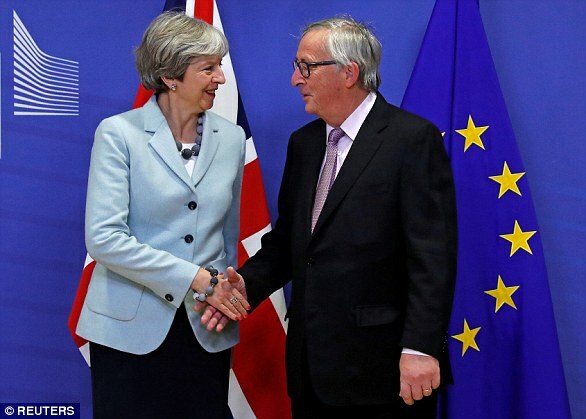 Mrs May had hoped the EU summit next month would be an opportunity to present firm proposals for future trade to the bloc's leaders. Brussels has been warning that failure to make progress at the summit - particularly on a way to avoid a hard Irish border - could stall negotiations altogether. 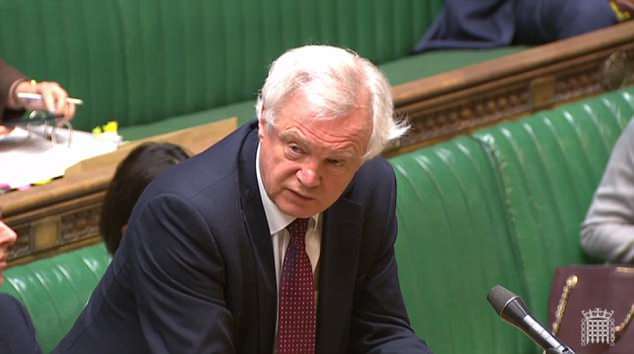 Answering questions in the Commons today, Brexit Secretary David Davis played down fears that ministers are at loggerheads. At yesterday's meeting, Mr Davis, Boris Johnson, Michael Gove and Liam Fox launched a drive against the customs partnership, in which Britain would collect tariffs to hand over to the EU. They warned the plan would damage Britain's ability to strike trade deals and leave the UK subject to EU rules. But critically, they were backed in their opposition by Mr Williamson and Mr Javid. Both had supported Remain and were seen as swing voters ahead of the meeting, but by joining forces with Brexiteers they effectively killed off the plan. No vote was held, but sources said the 11-strong committee was divided by six to five against the partnership. Supporters of the partnership idea claimed the group was actually evenly split as Mr Smith backed Mrs May. But that was mocked by Brexiteers who pointed out that the chief whip is not a formal member. The Prime Minister had hoped to present a preferred option to the full Cabinet on Tuesday, but instead had to order ministers and officials to conduct urgent work on both options. Downing Street sources stressed the urgency of finding a compromise to kick start trade talks with the EU. 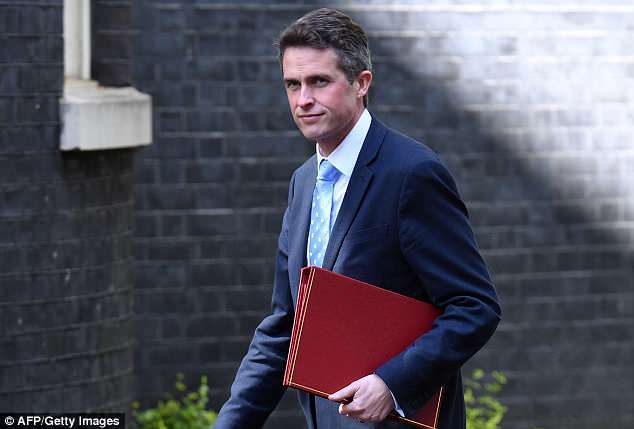 According to the Spectator, Mr Smith warned the Cabinet that the government would lose a vote in the Commons on the policy of shunning any form of customs union with the EU - one of the fundamental red lines Mrs May has set as it would mean Britain could not do trade deals elsewhere. Such a defeat could throw the whole Brexit process into more turmoil and even force Mrs May out of office. The Lords has already passed an amendment to the EU Withdrawal Bill urging the continuation of a customs union which will come before MPs at some stage - although ministers say the wording is loose enough that it could be accepted without significant harm. But Tory rebels are vowing to join Labour in backing an amendment to the Trade Bill that could force a showdown. The crunch point could come as early as next month, dependent on government business timings and whether the amendment is accepted. Around a dozen Conservatives have indicated they could vote in favour, enough to overturn Mrs May's slender majority. 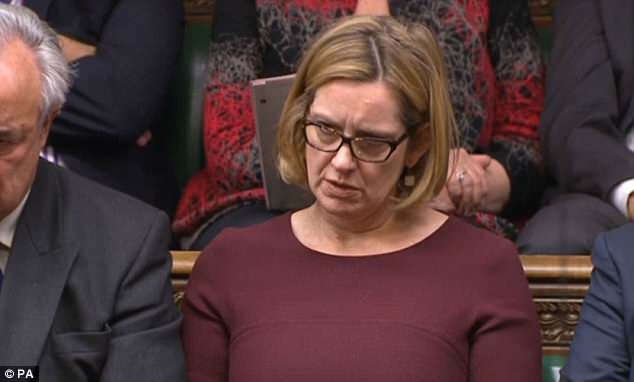 The Cabinet meeting last night followed the departure of passionate Remainer Amber Rudd, who had been expected to back the customs partnership, and her replacement with Mr Javid on Monday. Mr Javid switching sides effectively changed the balance of the committee. The decision was a blow to Chancellor Philip Hammond and Business Secretary Greg Clark, who argued in favour of the customs partnership. One source said Mr Clark had been 'close to tears' as he warned ditching the plan would threaten jobs. Friends of Mr Hammond said he was 'frustrated' and did not see how the alternative plan could resolve the need for a hard Irish border. The move follows a concerted push by Eurosceptics to strangle the customs partnership plan, which they had warned would wreck Brexit. The 60-strong European Research Group submitted a 30-page paper to Downing Street demolishing the plan. They warned the 'undeliverable' plan would end up being 'substantially the same as a full customs union with the EU'. Jacob Rees-Mogg said there was 'no question of an ultimatum' from Tory MPs over the issue. But he said there was a widespread view that the plan was 'deeply unsatisfactory'. 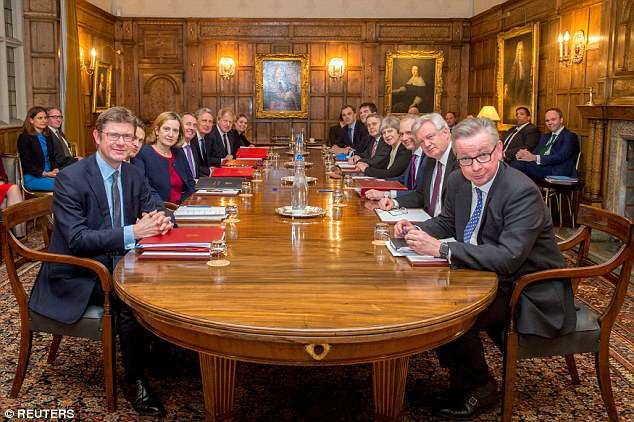 WHO'S IN BREXIT WAR CABINET AND WHERE DO THEY STAND? Backed Remain, has since insisted she will push through Brexit, leaving the single market and customs union. A strong Remainer during the referendum campaign, recently made clear he has not changed his mind about it being better if the country had chosen to stay in the bloc. Seen as one of the main advocates of 'soft' Brexit in the Cabinet. Has been accused of trying to keep the UK tied to key parts of the customs union for years after the transition ends. 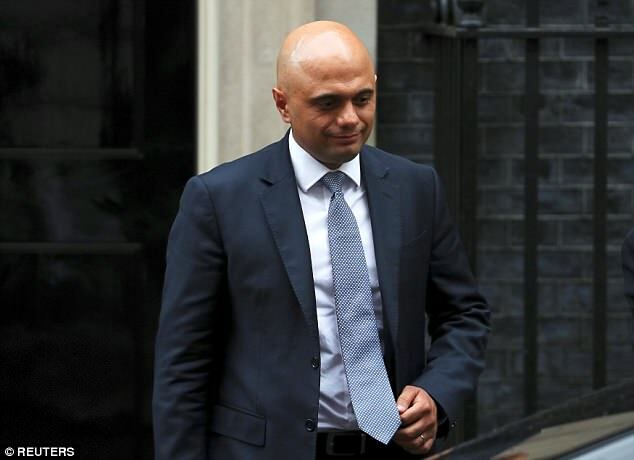 Brought in to replace Amber Rudd after she resigned amid the Windrush scandal, Mr Javid was seen as a reluctant Remainer in the referendum. Many thought the former high-flying banker would plump for the Leave campaign, but he eventually claimed to have been won over by the economic case. He is likely to focus be guided by evidence about trade calculations in discussions over how closely aligned the UK should be with the EU. The Brexit champion in the Cabinet, has been agitating for a more robust approach and previously played down the problems of leaving with no deal. He is said to be unhappy with plans for a tight customs arrangement with Brussels - warning that it could effectively mean being lashed to the EU indefinitely. Has buried the hatchet with Mr Johnson after brutally ending his Tory leadership campaign in the wake of David Cameron's resignation. Thought to be less concerned with short term concessions that Mr Johnson, but focused on ensuring the UK is free from Brussels rules in the longer term. A long-time Eurosceptic and veteran of the 1990s Maastricht battles, brought back by Mrs May in 2016 to oversee the day-to-day negotiations. He has said the government will be seeking a 'Canada plus plus plus' deal from the EU. Another Brexiteer, his red lines are about the UK's ability to strike trade deals with the rest of the world, and escaping Brussels red tape. On the softer Brexit side of the Cabinet, Mr Clark is thought to have supported Mr Hammond's efforts to maintain close links with the customs union. A close ally of the Prime Minister and viewed by some as her anointed successor. He is believed to be siding with the Brexiteers on the need for Britain to be able to diverge from EU rules. Supported Remain but a relatively unknown quantity on the shape of a deal. Replaced James Brokenshire, another May loyalist, after he resigned on health grounds last month. Some MPs warned whips they could withdraw support for the PM if the plan went ahead. 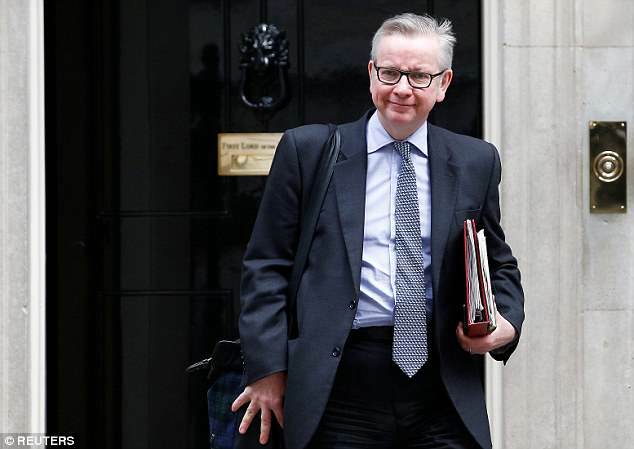 And senior ministers, including Mr Davis, Mr Johnson and Dr Fox made it clear to No 10 that they could not accept the proposal, which Mr Gove described as 'bonkers'. The backlash led to crisis talks in Downing Street on Tuesday night to discuss the way ahead. The customs partnership had been No 10's preferred option, with one insider describing it as 'intellectually perfect'. Supporters claimed it would resolve the Irish border issue and stood a chance of gaining approval in Parliament, where ministers fear pro-Remain MPs could vote to stay in a full customs union. But aides were forced to prepare the ground for a tactical retreat. At Prime Minister's Questions yesterday, Mrs May referred to there being 'a number of ways' to resolve the issue, rather than just the two formally on the table. Ahead of yesterday's meeting, No 10 acknowledged the position was 'evolving'. Officials also warned ministers at yesterday's meeting that neither plan was ready to be implemented by January 2021 when the Brexit transition finishes – raising the prospect of extending Britain's customs union membership temporarily. What are the options for the border between Northern Ireland and the Republic after Brexit? Theresa May and the EU effectively fudged the Irish border issue in the Brexit divorce deal before Christmas. But the commitments to leave the EU customs union, keep a soft border, and avoid divisions within the UK were always going to need reconciling at some stage. Currently 110million journeys take place across the border every year. All sides in the negotiations insist they want to avoid a hard border between Northern Ireland and the Republic, but their ideas for how the issues should be solved are very different. If they fail to strike a deal it could mean a hard border on the island - which could potentially put the Good Friday Agreement at risk. The agreement - struck in 1998 after years of tense negotiations and a series of failed ceasefires - brought to an end decades of the Troubles. More than 3,500 people died in the 'low level war' that saw British Army checkpoints manning the border between Northern Ireland and Ireland. 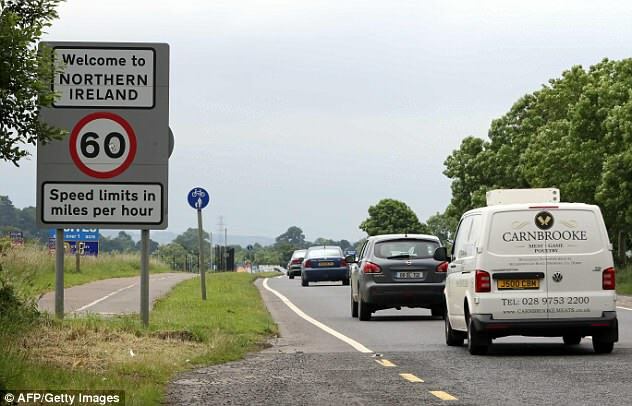 Both London and Dublin fear reinstalling a hard border - whether by checkpoints or other means - would raise tensions and provoke a renewal of extremism or even violence if people and goods were not able to freely cross. The DUP - which opposed the Good Friday Agreement - is determined to maintain Northern Ireland inside the UK at all costs, while also insisting it wants an open border. The PM has made clear her favoured outcome for Brexit is a deep free trade deal with the EU. The UK side has set out two options for how the border could look. One would see a highly streamlined customs arrangement, using a combination of technology and goodwill to minimise the checks on trade. There would be no entry or exit declarations for goods at the border, while 'advanced' IT and trusted trader schemes would remove the need for vehicles to be stopped. Boris Johnson has suggested that a slightly 'harder' border might be acceptable, as long as it was invisible and did not inhibit flow of people and goods. However, critics say that cameras to read number plates would constitute physical infrastructure and be unacceptable. The second option has been described as a customs partnership, which would see the UK collect tariffs on behalf of the EU - along with its own tariffs for goods heading into the wider British market. However, this option has been causing deep disquiet among Brexiteers who regard it as experimental. They fear it could become indistinguishable from actual membership of the customs union, and might collapse. Brussels has dismissed both options as 'Narnia' - insisting no-one has shown how they can work with the UK outside an EU customs union. The divorce deal set out a 'fallback' option under which the UK would maintain 'full alignment' with enough rules of the customs union and single market to prevent a hard border and protect the Good Friday Agreement. The inclusion of this clause, at the demand of Ireland, almost wrecked the deal until Mrs May added a commitment that there would also be full alignment between Northern Ireland and the rest of the UK. But the EU has now translated this option into a legal text - and hardened it further to make clear Northern Ireland would be fully within the EU customs union. Mrs May says no Prime Minister could ever agree to such terms, as they would undermine the constitutional integrity of the UK. Neither side wants a hard border between Northern Ireland and the Republic. But they appear to be locked in a cyclical dispute, with each adamant the other's solutions are impossible to accept. If there is no deal and the UK and EU reverts to basic World Trade Organisation (WTO) relationship, theoretically there would need to be physical border posts with customs checks on vehicles and goods. That could prove catastrophic for the Good Friday Agreement, with fears terrorists would resurface and the cycle of violence escalate. Many Brexiteers have suggested Britain could simply refuse to erect a hard border - and dare the EU to put up their own fences.